More conflict styles training, less prep time. You want your group or team to manage conflict well. And you don't have days to put into workshop design. Why reinvent the wheel? 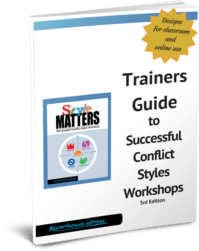 The newly revised Trainers Guide to Conflict Styles Workshops saves precious prep time with full outline of workshops in several formats. Trainer inputs, exercises, discussion questions, and more. Deliver a workshop your participants will love! NEW! Remote training and conflict styles learning at a distance.